Also known as the "Great Duke of Hades", Eligos is a highly respected demon due to his deep knowledge of warfare. In modern military terms he is a high-ranking General who not only understands the subtle strategies of warfare, but also has the ability to foresee an enemy's position and tactics ahead of the battle itself. It's not just in the heat of battle that Eligos comes in handy. In fact, he is most useful in the gathering of support for one's military campaign. He can influence important people to support one side of a war effort in both political terms and in terms of lending troops and weapons to the battle. The "battle" doesn't have to be of military nature, either. It is known that this demon Duke has helped humans in legal battles as well, giving key directives and influencing the outcomes of trials. Duke Eligos is a warrior knight and rides on the back of a winged horse who is also a demon. 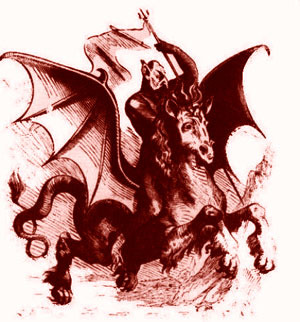 The horse, most commonly called "The Steed of Abigor", was a gift to Eligos from Bael and was reanimated from one of the original horses from the Garden of Eden. Return from Eligos to the List of Demon Names.